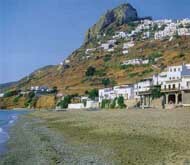 Skyros, Skiros, Skeros, Sporades Islands, Where to Stay in Greece, Greek Hotels, Apartments. Without doubt, Skyros is the odd man out in the Sporades. Set adrift from Skiathos, Skopelos and Alonissos (transport links with these islands are not frequent) much of its landscape and architecture is more in keeping with the Cyclades than its nearest neighbors. Hilltop Skyros Town is strikingly attractive. A maze of alleyways leads not to a harbor but to a main thoroughfare at best 20 feet wide that in places would test the hardiest mountain goat. The islanders have a long tradition of woodcarving and weaving and they host some particularly lively festivals - notably the Skyros Carnival, when masked revelers lead a raucous parade through the village streets. Skyros town's offbeat architectural layout is the result of several pirate invasions. What confounded pirates then may confuse you now; make sure to get clear directions to wherever you're going. Full of blissfully simple taverns are mixed in with the usual mini-markets and other small shops. More steps lead to the hilltop church where one can experience wonderful views over the rooftops of Skyros Town and beyond. Skyros is blessed with magnificent beaches. A 15 minute walk down the hill from Skyros Town and you are on the fine sands of Magazia where the pace of life is even slower than Skyros Town. A few tavernas and shops for basic provisions are the extent of development here and the beach never seems to get crowded!